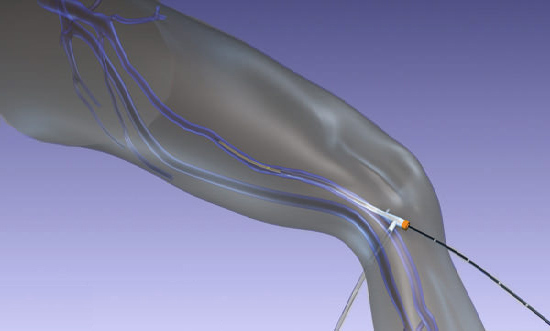 The latest advancement in varicose vein treatment is the Endovenous Thermal Ablation technique. This entails advancing a catheter through a very small incision up along the greater or lesser saphenous vein. Heat is then generated at the tip of the catheter and the device is slowly withdrawn. Either radiofrequency or laser energy is used to heat the inside of the vein. The heat destroys the cells that line the vein and cause thickening and scarring of the vein wall. This results in destruction of the vein and ultimately its elimination. The procedure steps are essentially the same requiring a small incision and passage of a catheter. The main difference is the type of energy used to generate the heat. With laser the source is obviously laser light. It is delivered through a transparent filament. With the radiofrequency, radio-waves are used to generate the heat. Additionally, a pronged tip is used to deliver the energy. The techniques have both been in use now for some time and good data is starting to come out of studies. 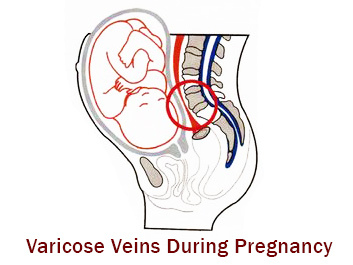 The ‘success’ rate of the two procedures is fairly similar, right around 90% with a 10% chance that the vein recannulizes (comes back) in the first 3 months. The main differences are in the post-procedure pain and bruising. 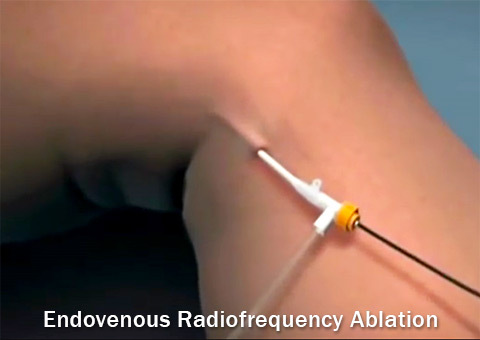 The radiofrequency technique is performed under direct visualization with ultrasound guidance. Additionally, the radiofrequency catheter has prongs that deliver the heat directly to the vein wall. This allows for good control over the delivery of the heat to the vein. The laser is not directly visualized and the energy is released into the center of the vein. This sometimes results in the laser burning through the vein wall and blood escapes causing the bruising. This can also causes burning of tissue outside of the vein including the skin which results in elevated levels post-operative pain. These problems are greatly reduced with radiofrequency because the physician can visually gauge how much heat to apply to any one area of the vein. Radiofrequency Ablation was the first of the endoluminal vein closure techniques and therefore has the oldest supporting data. However, not all providers offer this technique and may only have laser techniques available. It works very well and the post procedure pain is still quite tolerable when compared to other surgical procedures. 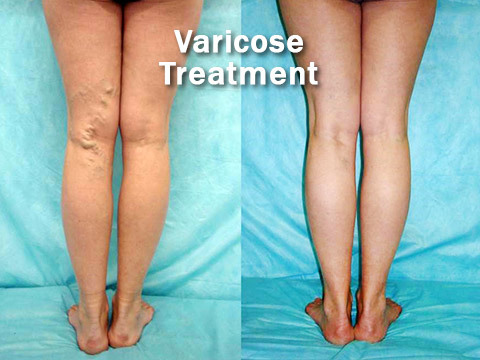 Both techniques are incredible improvements over traditional varicose vein stripping. This procedure is sometimes performed with conscious sedation and local anesthesia. It is most commonly performed with just local anesthetic. The leg is cleansed and a sterile drape is applied. The vein to be treated (usually the greater or lesser saphenous veins) is accessed with a large needle. A guide wire is then inserted and a catheter is placed. This is all done under ultrasound guidance to ensure proper placement of the catheter. Next the radiofrequency probe is placed in the catheter and positioned at the top of the vein being treated. The device is then turned on and heat is generated at the tip. The device is slowly withdrawn heating the vein as it passes. In the case of radiofrequency ablation this is accomplished under ultrasound guidance allowing for direct visualization of the closer. Following the treatment the incisions are closed with sticky strips and the leg is wrapped in a compression dressing. When performed under conscious sedation the tolerance is excellent. Patients are very comfortable and have little or no recollection of the procedure afterward. With just local anesthetic the procedure is tolerable, but frequent needle sticks and burning sensations are common and, in a few cases, more than the patient can tolerate. Like with other treatments a compression dressing is worn for 48 hours. The compression sock is then worn for 2 weeks by itself. Most patients will have some mild discomfort for several days to 1 week. 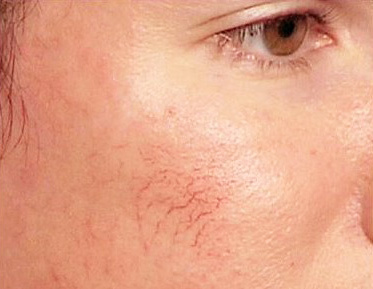 There is occasional more severe burning pain (this is more common with the laser technique), but this also resolves within days. Bruising is usually mild. Follow-up is usually 2-4 weeks. When the ‘main stem’ vein is closed the downward pressure is relieved off of the lower branches and spider veins. This can result in a decrease in the color and distention of these veins.